We’d love your help. Let us know what’s wrong with this preview of Later Gator by Jana Deleon. A poacher is at work in Sinful, Louisiana, and Deputy Carter LeBlanc is hot on the trail of the outlaw, trying to apprehend him before the state gets wind of the crime and sends a game warden to take over his investigation. Unfortunately, he’s hindered every step of the way by Sinful’s current mayor and all-around horrible person, Celia Arceneaux, who wants nothing more th A poacher is at work in Sinful, Louisiana, and Deputy Carter LeBlanc is hot on the trail of the outlaw, trying to apprehend him before the state gets wind of the crime and sends a game warden to take over his investigation. Unfortunately, he’s hindered every step of the way by Sinful’s current mayor and all-around horrible person, Celia Arceneaux, who wants nothing more than to drive Carter to resign. To ask other readers questions about Later Gator, please sign up. Hi Jana, I love love love your books. I travel a lot in my car so I tend to listen the audiobook versions. I was listening to the series and had to stop because I was laughing so hard and was afraid I would get into an accident. So my question, any insight as to when Later Gator will be out in audiobook format? Millie I got a response and wanted to share. "My agent is working on a contract with Audible but until then, I can't provide an estimated release date." If I…moreI got a response and wanted to share. I say it every time I write a review for this series: I love it! I won't say it is the best I've ever read, but it is sooooo fun! I love the characters, the setting, the slow heat romance, the lite mystery and the humor. Escapist reading at its' best. There is a poacher is at work in the bayou near Sinful, Louisiana, and Gertie is afraid her pet alligator, Godzilla, will end up on the BBQ. When a relative of Gertie’s is pinched for the dirty deed, the Swamp Team 3 spring into action. Now that Dep I say it every time I write a review for this series: I love it! I won't say it is the best I've ever read, but it is sooooo fun! I love the characters, the setting, the slow heat romance, the lite mystery and the humor. Escapist reading at its' best. There is a poacher is at work in the bayou near Sinful, Louisiana, and Gertie is afraid her pet alligator, Godzilla, will end up on the BBQ. When a relative of Gertie’s is pinched for the dirty deed, the Swamp Team 3 spring into action. Now that Deputy Carter LeBlanc knows the trio's secrets, he is watching them very closely to make sure they stay out of his business. I really wonder why he bothers, except nasty Celia Arceneaux, the current mayor, is looking for anything she can use to get rid of Carter, discredit Ida Belle and Gertie, and get rid of Fortune. That the evidence found by the game warden was planted is the starting point for the Team to track down the real poacher. This leads to another hilarious trip to the Swamp Bar and Carter pounding on the door, but coming up with nothing, except a handful of Fortune. With a few suspects it's time to narrow it all down and catch the poacher before he takes off. This is still over-the-top, superficial fluff and totally lacking in any believability but, hey, it's fun...though Gertie and Godzilla may be a bit much even by fluff standards. I only wish that Fortune and Carter actually spent more time together and that their romance would progress past the strictly G-rated phase it's been stuck in since book two or three. I didn't want it to end. What fun! The ninth addition to the Miss Fortune Mystery series by Jana Deleon. There is a poacher in Sinful, Louisiana, and it's up to Fortune and the girls to stick their nose in where they don't belong to solve the case. Another entertaining and very hilarious addition to the series. There was more of a romantic element in this book, as Fortune and Carter are officially a couple. I love this series and I hate that I have to wait for the next book. Honestly, I'm set to buy anything Jana writes. The adventure continues with the Swamp Team 3 and, of course, Gertie's hi-jinks! Their escapades are laugh out loud funny. If they made this series into a show, I would pray that they could capture those moments as perfectly as I see them in my mind as I'm reading it. Another great one in this series. I look forward to reading these because they always make me laugh. In this one there is a poacher in Sinful, taking out small alligators. One of the local boys is accused and arrested by the game warden which sends the town into a tizzy. Everyone is mad claiming there is no way Petey is responsible! Fortune, Ida Belle and Gertie are determined to clear Petey's name and find the actual poacher. Another entertaining book in the miss fortune series..!!! Jana DeLeon's books are always fun to read. This one doesn't disappoint! Funny but excellent story! Now that Fortune has decided to stay in Sinful, she has to decide what she wants to do. What will her career be? Carter and Fortune are having a hard time staying away from each other given what the ladies keep getting into. Maybe there is a chance for them yet! Now as the title says this has something to do with gators. There is a new person called Petey and his Father,Quincy. That is a mystery for solving. Who is poaching is another story/mystery. The most interestin Funny but excellent story! Now that Fortune has decided to stay in Sinful, she has to decide what she wants to do. What will her career be? Carter and Fortune are having a hard time staying away from each other given what the ladies keep getting into. Maybe there is a chance for them yet! Now as the title says this has something to do with gators. There is a new person called Petey and his Father,Quincy. That is a mystery for solving. Who is poaching is another story/mystery. The most interesting and humorous is the selection of people's pets. The race for who is mayor is still a mystery. So there are a few storylines and lots of action. Read this very interesting story and learn about compassion and understanding! Celia is up to her antics and the people seem to regret her being mayor at this time. Fortune is considering her options for future employment with Ida Belle and Gertie, for when there is no longer a price on her head. She is considering private investigation and how that would meet her skill set and her back on again relationship with Carter. Oh my, oh my! This book 9 in the Miss Fortune series that I have reported about in previous postings. This book is a little slower to start than usual … I just reached 29% and have gone off into gales of laughter with tears streaming down m Fortune is considering her options for future employment with Ida Belle and Gertie, for when there is no longer a price on her head. She is considering private investigation and how that would meet her skill set and her back on again relationship with Carter. Oh my, oh my! This book 9 in the Miss Fortune series that I have reported about in previous postings. This book is a little slower to start than usual … I just reached 29% and have gone off into gales of laughter with tears streaming down my cheeks. As always, Miss Gertie never fails to bring a good laugh. Imagine walking an alligator down the road on a leash. Nothing can go wrong, can it? When the three women of Sinful get together all bets are off. Every time I think nothing more can happen, it does. And it just keeps getting more and more funny. Now though, I have to wait for book 10. Later Gator by Jana Deleon was another fun escapade with Fortune, Ida Belle and Gertie. Once I start one of these books I cannot put it down. Great mystery plots and hilarious chaos with Swamp Team 3. I'm on to the next one. 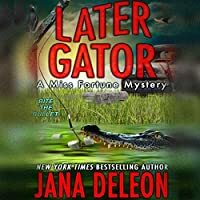 In Later Gator, the ninth book in Jana DeLeon's Miss Fortune mystery series, Fortune opens the book by debating her options for the future, in particular what kind of career she should pursue now that she has decided to leave the CIA after the price on her head has been lifted. She is intrigued by Ida Belle's suggestion of becoming a private investigator so decides to practice her potential new career. 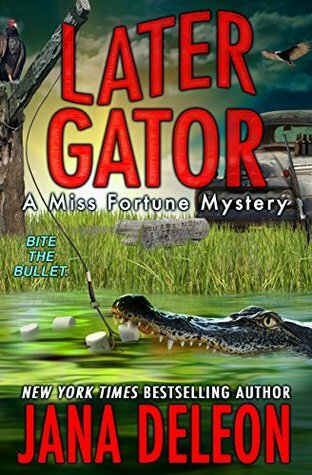 She begins by starting with Deputy Carter's recent case of an alligator poacher who does not b In Later Gator, the ninth book in Jana DeLeon's Miss Fortune mystery series, Fortune opens the book by debating her options for the future, in particular what kind of career she should pursue now that she has decided to leave the CIA after the price on her head has been lifted. She is intrigued by Ida Belle's suggestion of becoming a private investigator so decides to practice her potential new career. She begins by starting with Deputy Carter's recent case of an alligator poacher who does not behave like either a local or a professional. This poacher goes for only small gators and acts sometimes during the day, both unusual activities for a poacher. While flying around the local bayous in Fortune's air boat, Ida Belle and Fortune get cut off by an arrogant Fish and Game warden, who takes out his annoyance at them by demanding to inspect their boat. He obviously is looking for poached alligator, thus making it clear that Carter has not been successful at keeping the poaching problem a local issue. Then the Fish and Game official drags Petey Hebert into the jail, ordering Carter to keep him locked up as the poacher. The problem? This cousin of Gertie's is deeply disturbed and clearly incapable of committing this crime. You can never have a bad day if that day includes a Jana DeLeon book. Especially if it's a Miss Fortune book. Later Gater is another hit. Only Gertie would decide she should have an alligator as a pet. The Swamp Team strikes again as Fortune is trying to make some serious decisions about what to do with her life. Gertie and Ida Belle suggest she might make a good detective, so the three throw themselves into investigating an alligator poacher . The results are what you might expect from the Three You can never have a bad day if that day includes a Jana DeLeon book. Especially if it's a Miss Fortune book. Later Gater is another hit. Only Gertie would decide she should have an alligator as a pet. The Swamp Team strikes again as Fortune is trying to make some serious decisions about what to do with her life. Gertie and Ida Belle suggest she might make a good detective, so the three throw themselves into investigating an alligator poacher . The results are what you might expect from the Three Stooges of Sinful, Louisiana. I had read Ms. DeLeon's Ghost-in-Law series and had gotten a copy of the first book in the series free. I started reading and couldn't put the series down. I want to thank the author for the enjoyment I have had and looking forward to more in this series. I giggled all the way through this addition to the Miss Fortune series, except when I was laughing out loud. Gertie and Godzilla the gator are a pair! Ida Bell and Fortune spend a lot of the book so exasperated with Gertie they can hardly function, which adds to the general hilarity. It's nice that Fortune and her deputy boyfriend finally get some advancement in their romance, but it's secondary to the plot as far as I'm concerned. I enjoy these books for the fluff and the mystery, although the I giggled all the way through this addition to the Miss Fortune series, except when I was laughing out loud. Gertie and Godzilla the gator are a pair! Ida Bell and Fortune spend a lot of the book so exasperated with Gertie they can hardly function, which adds to the general hilarity. It's nice that Fortune and her deputy boyfriend finally get some advancement in their romance, but it's secondary to the plot as far as I'm concerned. I enjoy these books for the fluff and the mystery, although the romance is a nice sub-plot. The friendship between Ida Belle and Gertie, and the addition of Fortune to the duo, is what makes the whole series work for me. Later Gator is a splendid addition to the series. Fortune's angst about what to do with her life actually adds to the humor, even though that's the serious part. Deleon has a way of making even the serious stuff fun, which adds to my general enjoyment of this book. I went back and re-read all the previous books, since I had gotten side-tracked before I got completely caught up (so many books, so little time), but now I'm keeping on to the latest one and happily awaiting the next in the series. Things are getting crazy in Sinful. Fortune is still hiding out in Sinful, after the life changing decision at the end of the last book she feels a bit scared of where her future may be headed and her place in it. But this is Sinful and she doesn't get long to brood, Celia is still mayor and making Carter's life miserable trying to force him to resign. Added to which somebody is poaching alligators, the culprit seems to be a relative of Gertie's but there's no way it can be true. Celia though see Things are getting crazy in Sinful. This story is a return to Fortune, Gertie, and Ida Mae trying to the right the wrongs done to another Sinful resident. Celia is still mayor and they are awaiting the re-count from the election results. The girls are up to their usual antics in this book. It was nice to see that things returned to a slower pace filled with more humor. The last two books have been lots of drama and change for Fortunes character. Fortune is now trying to figure out what she would like to do after she leaves the CIA. As she is considering her job options she is also trying to decide how she wants things to go with Carter. I will say that it has been 9 books and even though these characters have danced around each other the entire time, I have not been annoyed yet. They are just so cute and I can't help but want the best for them. I am a big fan of the Miss Fortune series so I was excited to read this installment. The humor,as always, was in track. The characters are loveable and the writing is so descriptive that the story plays out in my mind's eye like a movie. I only rate at 4 stars because the story is short. There is no grand ,epic mystery here. Just a short and sweet who done it. My biggest complaint is the price. For the cost of the book i would like more story. Instead, I get 4-6 hours of giggles. I read too much for that to be affordable. I wish Ms. DeLeon would put her books in kindle unlimited. But for now I have to settle for buying when I can afford it and borrowing th test of the time. I'm not sure what happened - usually Miss Fortune is my very favorite series and I know not everything will be perfect and completely believable but I'll have so much fun along the way I won't mind it a bit. Unfortunatelly this time it didn't work and since I'm not sure if it's just me and my personal situation right now or if the humour became stale (most of the situations I've already read in one variation or another) plus the over-the-top-antics of the 'Troublesome Trio' just appeared too muc I'm not sure what happened - usually Miss Fortune is my very favorite series and I know not everything will be perfect and completely believable but I'll have so much fun along the way I won't mind it a bit. Unfortunatelly this time it didn't work and since I'm not sure if it's just me and my personal situation right now or if the humour became stale (most of the situations I've already read in one variation or another) plus the over-the-top-antics of the 'Troublesome Trio' just appeared too much. I deliberately reserved this installment of the Miss Fortune series for a long drive, knowing I would need reliable entertainment while I was a captive audience in a vehicle. As usual, Miss Fortune and her two elderly sidekicks got into a lot of trouble, ate a lot of good food, and solved a mystery. The romance between Fortune and Sheriff Carter took another teensy step forward. If there was one thing I would change about this series, it's that Gertie gets into too many accidents. The ability of I deliberately reserved this installment of the Miss Fortune series for a long drive, knowing I would need reliable entertainment while I was a captive audience in a vehicle. Just because your characters repeatedly mention how stumped they are does not mean the reader is. This was rather a predictable one mystery-wise. Also I still hold the author's best sexual tension comes when she's not trying because otherwise it is forced and weird. HOWEVER, Gertie has a pet alligator and that makes up for all. Also what is this my library is telling me about a 3 week waiting period for the next book. I am not okay with that. The beauty of this series is how fast I can dash thro Just because your characters repeatedly mention how stumped they are does not mean the reader is. This was rather a predictable one mystery-wise. Also I still hold the author's best sexual tension comes when she's not trying because otherwise it is forced and weird. HOWEVER, Gertie has a pet alligator and that makes up for all. I love this series. I don’t know what else I can say. Fortune is such an amazing character (love to see her in action with Ranger from the Stephanie Plum series!) and the Geritol Mafia, aka Ida Belle and Gertie, would have to be the sassiest, most intelligent and resourceful senior citizens I’ve ever encountered in a book/series. Sinful is such a hotbed on intrigue, and it looks like Fortune’s arrival was just the catalyst needed to bring all the seedy underbelly to the surface. Not great for Fo I love this series. I don’t know what else I can say. Fortune is such an amazing character (love to see her in action with Ranger from the Stephanie Plum series!) and the Geritol Mafia, aka Ida Belle and Gertie, would have to be the sassiest, most intelligent and resourceful senior citizens I’ve ever encountered in a book/series. Sinful is such a hotbed on intrigue, and it looks like Fortune’s arrival was just the catalyst needed to bring all the seedy underbelly to the surface. Not great for Fortune as she tries to stay undercover, but fabulous for readers. I usually listen to these books on Audible unless the audio is not out and I need my fix fast. This installation did not disappoint, and I enjoyed reading it all the way through to the end. In fact I slowed down my pace because I did not want it to end. Because then I have to sit in agony waiting for the next one. Anyone who's read this series will love this installation just as much. I love the pace of the romance and excitement and would not want it to change. Please pl Just Love These Books!!! We're back to some laugh-out-loud funny moments in this one, as Gertie tries to save her favorite alligator, Godzilla, from the predations of a poacher. The accused individual is a 19-year-old boy with mental health issues, and no one believes he's responsible except the game warden. So, this time it's up to Swamp Team 3 to clear Petey's name ... and hijinks ensue. I have found that these light mysteries cheer me up during this difficult time in the world. We take the smiles where we can get them, We're back to some laugh-out-loud funny moments in this one, as Gertie tries to save her favorite alligator, Godzilla, from the predations of a poacher. The accused individual is a 19-year-old boy with mental health issues, and no one believes he's responsible except the game warden. I love this series. If Gertie was a real person, I would love to meet her! We should all aspire to be so colorful in our later years. After living in the south for a couple of years, I get the southern flavor of these books and sometimes I miss being down there. It is a whole different world, but in a good way. I did not appreciate that fact until I moved back. I have enjoyed Jana's books for a few years now and she never disappoints!! New York Times and USA Today bestselling author Jana DeLeon was raised in southwest Louisiana among the bayous and gators. Her hometown is Carlyss, but you probably won't find it on a map. Her family owned a camp located on a bayou just off the Gulf of Mexico that you could only get there by boat. The most important feature was the rope hammock hanging in the shade on a huge deck that stretched ou New York Times and USA Today bestselling author Jana DeLeon was raised in southwest Louisiana among the bayous and gators. Her hometown is Carlyss, but you probably won't find it on a map. Her family owned a camp located on a bayou just off the Gulf of Mexico that you could only get there by boat. The most important feature was the rope hammock hanging in the shade on a huge deck that stretched out over the water where Jana spent many hours reading books.